Have you ever noticed how movie sequels can be really disappointing compared to the first movie whereas, the 2nd and subsequent novels in a triology or series are as good if not better than than the first novel? Think of Ghostbusters, Speed, Jaws, Grease, any of the early Disney movies like Cinderella II, The Little Mermaid II, etc. There are series of books where the 2nd book isn’t worth reading too, I just feel like it happens more often in movies. 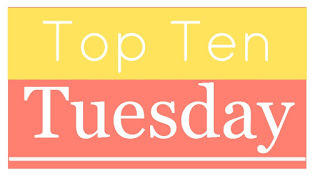 This week’s Top Ten Tuesday hosted by The Broke and the Bookish is Top Ten Sophomore Novels That I Loved Just As Much If Not More As The Author’s Debut. As I alluded above, I’m altering this a bit to the 2nd book in a series or trilogy. My memory doesn’t work well enough to be able to compare an author’s debut novel with subsequent novels, lol. Let’s get started. Saga, Vol 2 by Brian K. Vaughan. The second volume of Saga was just as wonderful as the first. The story, the characters, the artwork, everything. Curtsies and Conspiracies by Gail Carriger. This is the second book in Carriger’s Finishing School series. I love all of Carriger’s books and series and this book was no exception. Glory in Death by J.D. Robb. I wish all the In Death books were as good as the second one. Robb’s into the 30s now, almost at book 40, and they’re losing some of their luster. Shadow of Night by Deborah Harkness. I think I liked this second book in the All Souls trilogy better than I liked the first one. As for the third book, I didn’t even finish it. What a disappointment compared to the first two. Forever Odd by Dean Koontz. I’ve gone on and on about this series in the past. I love all of the Odd Thomas books. Two for the Dough by Janet Evanovich. The Stephanie Plum novels are my go-to feel good books. They always make me laugh. Dearly Devoted Dexter by Jeff Lindsay. This second novel in the Dexter series held up just as well as the first. I think this is another instance where I liked book two better than book one. Catching Fire by Suzaane Collins. Again, I liked book two better than book one. This book was more emotional than the first and being familiar with the characters, you’re more invested. The Hawk by Monica McCarty. This is the second book in McCarty’s Highland Guard series. I most definitely liked this book better than the first. The first was good, but I liked the characters and their story in The Hawk more. I blamed time instead of my memory, but I imagine both are true in my case. 🙂 I like the twist you took with this one. I can’t remember if I liked the first Dexter book or the second better. I know the last one I read in the series (which is not the actual last book), I found a bit too disturbing and haven’t yet picked up the rest of the books in the series. Someday maybe. I actually preferred the first of Harkness’s novels and found the second to the be the weakest. I’m going to try J.D. Robb’s series again. I didn’t like Naked In Death at all, but now that I’ve come around to reading romance again, I maybe give it–and the series–another try. We’ll see. I think what I liked about book 2 of Harkness’s series was the setting. You know, I haven’t actually finished the Dexter series. I still need to read 7 & 8. I always recommend the In Death series to people. I didn’t start that series with book one (I didn’t realize it was a series at first) so I can understand why the 1st book might not hook people. I also have a hard time categorizing this series. While there is the romance aspect to them, “romance” would be at the bottom of the list of genres I would pick. After the 1st few books, romance becomes secondary to the point. Ooh, Saga! I forgot about them. I wish I could get my hands on all the future volumes, all at once–I wait for the collections, but it’s still not enough story. I started out reading them as they were published, so I have one and two. But then I slacked off on buying them. I want to keep buying them in their individual volumes but when I looked this weekend, the store didn’t have 3 >:| Otherwise, I’d give in a buy the collections. Awww. I’m sorry you didn’t have a better time with it.